There is nothing quite like an air impact wrench for getting those stubborn rusty nuts off! But there are lots of questions to answer before purchasing your first one. Hopefully, as you read further, you will be able to answer those questions and make a better decision as to which one is right for you. As with all new toys, some air impact wrenches stand apart from the rest and these will be the ones that will get reviewed in more detail here. *** Different companies will use different assumptions of how long the air tool will be used within the space of a minute. Therefore the average air consumption value stated in the table is only useful when comparing tools from the same company. NB: a point to note about air impact wrench airflow ratings is that these figures are based on the use of the tool intermittently. The duty cycle for air impact wrenches is generally taken as 25% – ie. in any time period, the wrench will be used a total of 25% of that time period, for example, for 15 seconds within a minute. However, some air tool companies have stretched their assumptions a little and often the average rating is based on more like a 20% duty cycle rather than 25% (so about 11 seconds usage within any 1 minute period). Of course not everybody will use their impact wrench at that level. Some workshops might use it more frequently, others like regular consumers might use it for less time – for example, if you wanted to change a tire on your car, you might take about 1 second to loosen a single wheel nut, and there are 6 wheel nuts, so you might use your tool for maybe 6 seconds within a minute. In this situation, you would need your air compressor to deliver only half the company’s stated air volume rating for the air impact wrench in question. In other words, you could get away with a smaller air compressor for your chosen impact wrench. Check out the calculator at the bottom of the page to get a better idea of the size of air compressor and its CFM rating that you might need based on your likely usage of a specific air impact wrench. Aircat is a US company although some of its components are sourced from the far east – but isn’t everything these days?. The Aircat 1150 air impact wrench exerts a very high 1295 ft-lbs of torque but at the same time it is one of the quietest air impact wrenches out there! How can that be? Apparently they have developed some unique sound-muffling technology that is now patented so you won’t find it elsewhere. Another unusual feature of this tool is that the forward and reverse as well as the torque setting switch is located on the back of the air impact wrench – some old hands might not like that but one advantage of having it located there is that it is very easy to tell what setting you are at. The switch has 3 forward torque settings and 1 reverse. To give you an idea of the power, the lowest forward setting is sufficient to take wheel nuts off easily. The video below gives you an idea of what it’s like. The Ingersoll Rand 231C air impact wrench has been so popular over time that this model has stuck around for the best part of 25 years! – not many products can lay claim to such an accolade. Of course, it has been tweaked and and updated over that time adding in improvments that have continually bettered its performance. However, the 231C is not as powerful as the Aircat above and some newer Ingersoll Rand models (like the 2135TiMax discussed below), but then again, not everybody is looking for the most powerful impact wrench on the block. For the average consumer and DIYer, this will more than suffice for wheel rotations and some stubborn lug nuts, and you don’t have to break the bank to own one. However, if you are planning on doing some heavy-duty automotive work or have some heavily rusted-in nuts, then you would be better served by a more powerful model. The variable power control has 5 forward settings and a single reverse one, and for the more traditional crowd amongst you, it continues to be the old faithful push-button type that many prefer. On the negative side, one issue owners have had with this impact wrench and other Ingersoll Rand models is that removing the socket is near impossible without using hand tools to help. As always, there is nothing quite like seeing the air impact wrench in action, and the excellent video below is a good way to get your first ‘feel’ of it – check it out! This Ingersoll Rand air impact wrench is the more powerful cousin of the 231C disscussed previously and is on a par with the Aircat 1150 beast. In fact, people often have a hard time deciding between it and the Aircat when they are shopping around for a rust-busting impact wrench. 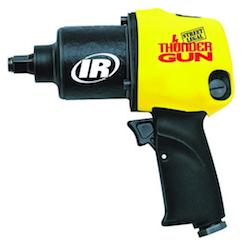 Unusually for such a powerful model, it is one of the lightest impacts out there giving it one of the best power-to-weight ratios for any air impact wrench around. Unfortunately, all that power in a light package (mostly titanium, the stuff they use for space ships) makes for a hefty price tag! In the video below, you will see one of the advocates for the tool, the ex-Nascar tire changer, DJ Copp, as he compares it against an actual top-of-the-line Nascar tool. NB: The calculator has a ‘safety factor’ of 1.2x CFM incorporated to ensure the right air compressor, which can match (and more) the requirements of the air impact wrench being queried, is chosen. It also also factors in the variability in duty cycle assumptions that different companies use when calculating the average CFM rating for their air impact wrench.